Guide in 'General Information' published by GeekMatt, Apr 26, 2015. The list below will help you to consider the primary languages that are likely to be spoken on any given server. Additionally, the data centers let you know the distance you are from the server. (Pease note, the European data centers are believed to be in Montreal Canada, and would normally fall under NA). 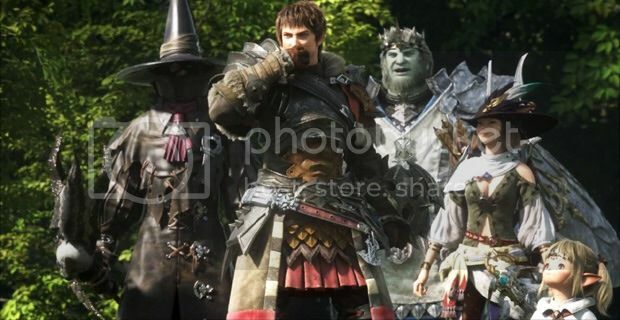 In other MMORPGs picking your race may have much to do with which stats suit you best, but on FFXIV the difference in stats between races are so minimal that your selected race has much more to do with your aesthetic preference, especially since you're likely going to be playing all sorts of different classes on your one character, and one character of any race is fully capable of performing in all content and all classes as well as any other race. Please note, if you wish to change your race after character creation, you can do so using an in-game item called "Fantasia". This item will be given to you after one month of PAID membership as a Veteran Reward. Additionally, you can purchase Fantasia using real world money from the official website's Mog Store. In FFXIV the class you pick ultimately becomes a "Job" by simply equipping your Soul Stone which is acquired by having your main class to level 30, and the necessary secondary class to level 15. While you aren't obligated to play as the Job, playing as your class longer than needed is not advised -- while you do lose certain skills by unlocking your job, you also gain new ones which are vital to your purpose. It is important to note that in FFXIV your one character can play as ALL classes/jobs, and it can do so affectively. Once you reach level 10 you unlock the ability to pick up other classes from their respective class guilds. Additionally at level 15 if you keep up with your main Scenario quests (recommended) you'll unlock travel to other cities which allows you to join the class guilds located there. The Class you choose to start with will determine which city you start up in. Paladin is the ultimate defensive tank with additional damage mitigation stats due to it's use of the shield. The job utilizes an arsenal of defensive cooldowns. Why? PLD has a lower aggro build than other tanks, and in lower dungeons (or with relatively low gear) it's not unusual for GLA/PLD to struggle in aggro management as a result. It also involves a very straight-forward set of skills and a simple combo for aggro management. Break the Stigma: Use the tools provided, as well as your own experiences to recognize where aggro generation is most needed. When you've got a grasp on aggro management, learn to master your defensive CDs and to support the party -- this is where PLD becomes interesting and not quite so straight forward. Why? WAR requires a more proactive style of play when it comes to survival, since you self heal in loo of defensive CDs in comparison to PLD. WAR involves a more complex play style for survival. Break the Stigma: Be more aware of healer strain, and learn to anticipate when to buff and/or restore HP. Most of all, know your skills and combos and understand how they work. White Mage is the high potency healer, utilizing powerful single target and AoE heals. Break the Stigma: Carefully utilize the skill Shroud of Saints to rebuild MP, and know the cost/potency of your heals to make efficient decisions. A skilled WHM will not require any additional Piety to be fully affective (though that doesn't mean it's a bad stat to have, decide for yourself). Scholars are defensive, proactive healers, utilizing various spells that protect the party and a summoned fairy to further their cause. WHY? Scholars have lower potency heals, and this leads people to think they're inferior. Additionally, their skills aren't so simple and straight forward compared to WHM, resulting in fewer people playing the class affectively. Break the Stigma: Know your skills, learn the fight you're working on, and make it a point to shield and heal your party proactively. I'd argue that no class can benefit a party more than a master Scholar. Bards are masters of the bow, able to move and maintain DPS from a distance. BRDs utilize lower potency rapid-fire skills for DPS and an assortment of songs to support their party. The Stigma: An "easy" support class. Why? The Bards songs support the party and often come at the cost of lowering their own DPS. Additionally, the ability to move and DPS simultaneously leads people to feel they don't require skill to play. Break the Stigma: Know your skills--when to play the appropriate song and when not to. Also, know your DPS rotation, it's not a short and simple one and your potential for bursting down dangerous adds and helping meet enrage timers makes you a vital asset. Having a BRD in your raid group is practically a must. Black Mages are high potency caster DPS, brutally damaging the enemy with each blow. BLMs are also highly capable in AoEing enemies, devastating large groups of mobs simultaneously. Why? Black mages have potentially unlimited MP, and a relatively simple DPS combo. Break the Stigma: While others may not actually recognize the complexities of your class, the fact is BLMs real skill lays in building the perfect combo and being able to adapt it to any given situation without blowing your MP (leaving you dead in the water DPS-wise) while still effectively devastating enemies. Dragoons are melee DPS, wielding lances and the like. They're renown for their fancy armour and high flying jump attacks. They have the most defence of any DPS class, and often perform the more dangerous roles when necessary. Why? Dragoons skills involve some graphics lock, rendering them temporarily immobile while performing certain attacks, in addition they have certain positional requirements for certain skills. These can be deadly during enemy AoEs. Break the Stigma: Know which skills involve a graphics lock, get a feel for their duration and use the skills only when it's safe to do so. Learn the fights you're working on to anticipate the need to dodge. Monks are fist-fighting melee DPS. Fast hitting, lower potency attacks--MNKs are potentially the highest DPS job out there. The Stigma: Fails to prioritize/deal with mechanics. Why? MNK has a relatively complicated DPS rotation, and your DPS is dependant on keeping your combo going constantly in order to maintain your buffs. Some MNKs fail to prioritize important mechanics over maintaining their DPS. Break the Stigma: It's important to keep up your DPS, but don't let the party suffer by failing to handle important mechanics. Know what your party needs from you, and be a team player. Ninjas are a fast hitting DPS with utility. Utilizing elemental mudra attacks and melee physical DPS, NINs pull high DPS, adapting to a variety of circumstances. The Stigma: "The new DRG" dies frequently. Why? NIN are squishy and have a relatively complex DPS rotation to focus on. Additionally, you have one skill with graphics lock and another with positional requirements. Break the Stigma; Prioritize dodging over DPSing. Be careful when you use Assassinate because you'll be unable to dodge briefly. Summoners are a high DPS caster class utilizing DoT skills and a variety of summoned pets (one at a time) to suit different circumstances. SMN are also the only non-healers able to resurrect players in battle. Why? You're a DoT (Damage over Time) class, so your high potential isn't easily recognized by ignorant players, and isn't always impressive on low hp targets. Break the Stigma: There's not much you can do to break the stigma, but your overall DPS is potentially one of the highest of all the jobs. Know your skills, know your rotation, and don't forget you can Rez people! Sunspawn, Somarlane and Caimie Tsukino like this.